Polar Bears International (PBI) is a non-profit organization dedicated to polar bear conservation and educating people about the effects of climate change on the arctic ecosystem. 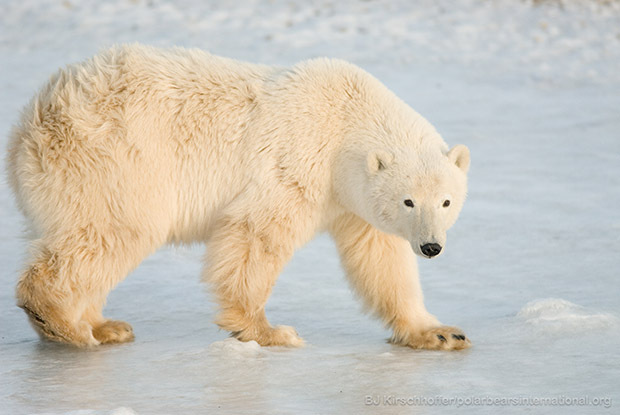 PBIs free educational broadcasts connect scientists in the field with students from all over the world who want to learn about polar bears, and how they can help. The webcasts take place from Churchill, Manitoba from a Tundra Buggy, a large tourist vehicle that has the ability to move over the tundra and keep viewers out of harms way. PBI needed to switch between multiple camera angles during the broadcast. They also wanted to add in motion graphics, slides and other video sources to produce a unique and entertaining educational show. Their other main challenge was getting a connection from such a remote location to stream their broadcast to the world. PBI chose Wirecast Pro to do the live switching and streaming for their shows. They fixed several hardwired Sony PTZ cameras to the outside and inside of the Tundra Buggy, with a control deck to adjust the angles and zoom of the cameras. The cameras all come into an Apple MacBook Pro using a Canopus ADVC 110 firewire capture device. Wirecast is a simple yet effective tool that allows us to mimic everything a large television studio would do, but from our remote location. Said BJ Kirschhoffer, Director of Field Operations, Polar Bears International. Audio comes in through a Peavey mixer tied directly to the line-in input of the MacBook Pro. Sennheiser microphones placed just out of camera frame connect to the Peavey mixer to complete the audio system. Inside the buggy, 2-4 panelists sit near the front of the vehicle, with an indoor camera trained on them. The large windshield (4'x12') serves as a background, giving viewers a small taste of what is going on outside the vehicle. All of the video and audio mixing happens inside the buggy, just a few feet away from the panelists. There is small desk with the computer running Wirecast, the audio mixer, joystick to control the cameras, and a monitor. One person can manage the entire show from there. To bring the outdoors to life they use Wirecast to switch between the outdoor cameras showing the bear action taking place just feet away, the indoor cameras showing the panelists and the pre-recorded content. The panelists and host see the outgoing video feed on an LED monitor by using the external display out function in Wirecast. To get their broadcast to the Internet, Wirecast encodes and streams the broadcast through PBIs private long distance (6mi range) omnidirectional wireless network. This network allows the buggy the freedom to roam with the bears. The signal is transmitted an additional 20 miles to town via a wireless backhaul system. In the town of Churchill their wireless system connects to the Internet and completes the distribution to either Ustream or Livestream channel. Telestream Wirecast brings ease to planning, producing, and encoding our live events. The product makes us successful by allowing us to produce a high quality production more similar to TV than a typical webcast, stated Kirschhoffer. The Tundra Connections program is entering its 7th year. Each season PBI is able to reach tens of thousands of people during their short 4-week schedule. Their end goal is to bring awareness to people about how climate change is affecting the polar bears. Ultimately with the help of Wirecast, they want every person to understand their actions can make a difference. The Wirecast software is so powerful and it is all I need to bring the polar bears into thousands of classrooms all over the world. says Kirschhoffer. I love this product.